We’re lucky to have great choices for food in this small town. 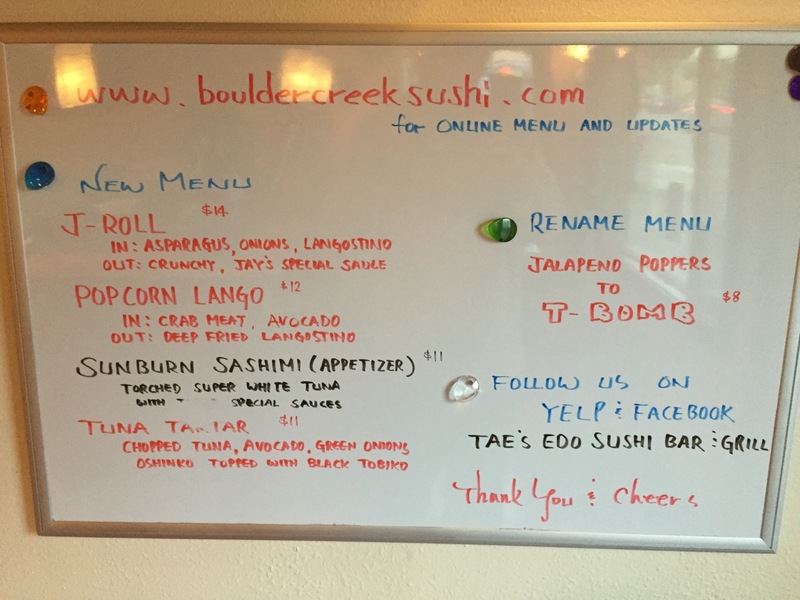 We have The Brewery, Boulder Creek Pub and Pizza, Scopazzi’s, The Redwood Keg and some really top-notch sushi at Tae’s Edo Sushi. Below is an image of this week’s specials. To see their full menu click HERE to visit their website. Today is the night to order pizza and support our Elementary School Science Department. 20% of all sales from 4:00pm – 9:00pm will be donated to BCD Science Department by the ever generous Justin, owner of Boulder Creek Pizza & Pub. There will also be trivia hosted by BCFN parent and BCE president Tammy Schulz. 4 games of trivia will start at 5:30pm, each game is 30 minutes. As the night goes on the questions will get harder. The trivia is geared toward 5 – 10 year olds with some tougher ones thrown in, and prizes will be awarded. 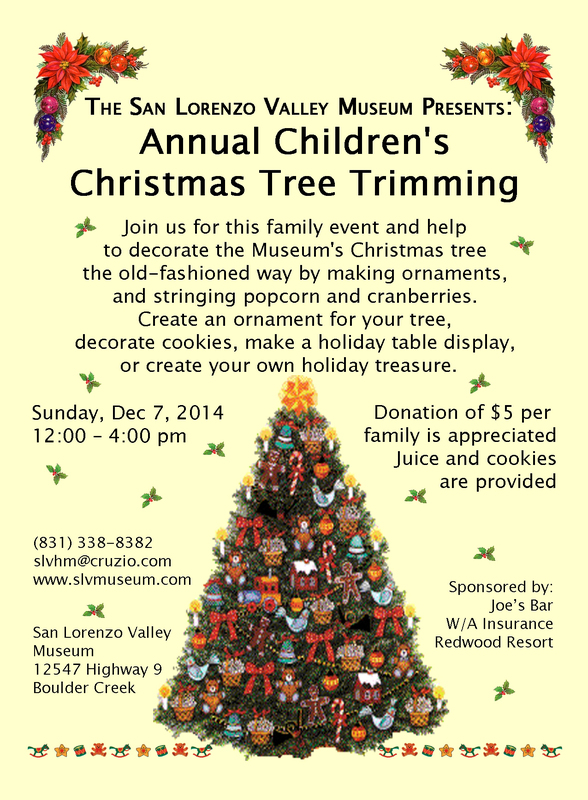 San Lorenzo Valley Museum is having their 11th annual Children’s Christmas Tree Trimming this Sunday from 12noon till 4pm. Come decorate the Christmas tree as a family the old-fashioned way by making ornaments and stringing popcorn and cranberries. You can make an ornament for your tree, decorate cookies, help make a holiday table display, and create your own holiday treasure. Juice and cookies are provided. It should be a wonderful family event to get everyone in the spirit for the holiday. So come out for some old-fashioned family fun. Instead of going to the big box stores enjoy the wonders of our downtown this Black Friday. 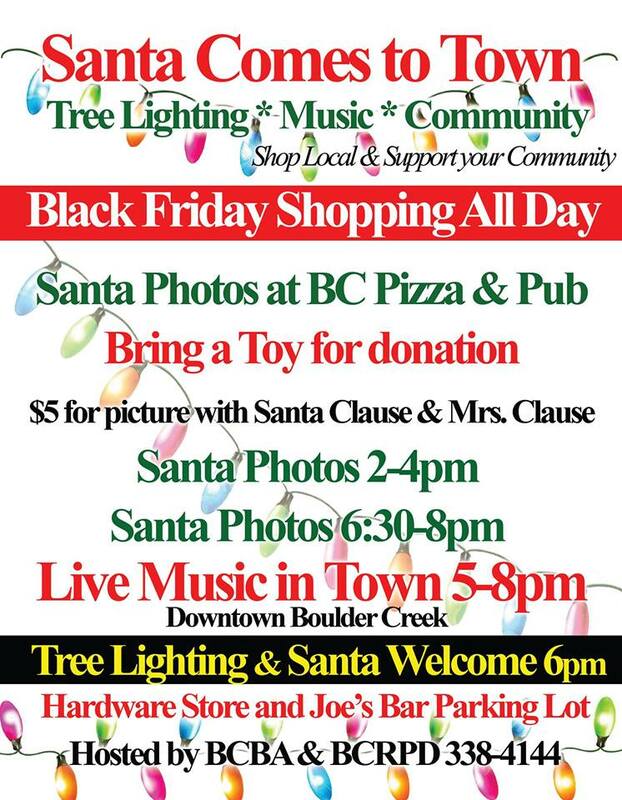 We will have pictures with Mr. & Mrs. Santa Claus, tree lighting, music throughout town, tractor carriage rides, and other festivities. Locations and times for all the activities are listed above. I hope you are all having a wonderful Thanksgiving with family and friends. Oh and don’t forget Small Business Day is this Saturday. This is another wonderful event brought to you by our Park & Rec. Thank you Hallie and the board for all you do and for all the wonderful events you guys make happen. I am so thankful for being part of such a wonderful and rich (in all the right ways) community. This Sunday Camp Joy is having their annual Open House and Harvest Celebration. They will have wreaths, garlic, onion breads, candles, honey, and other goodies for sale as well as yummy treats to sample. So come out and support Camp Joy with your holiday shopping and enjoy an autumn afternoon on the farm. Camp Joy is a small organic educational non-profit family farm based in Boulder Creek. 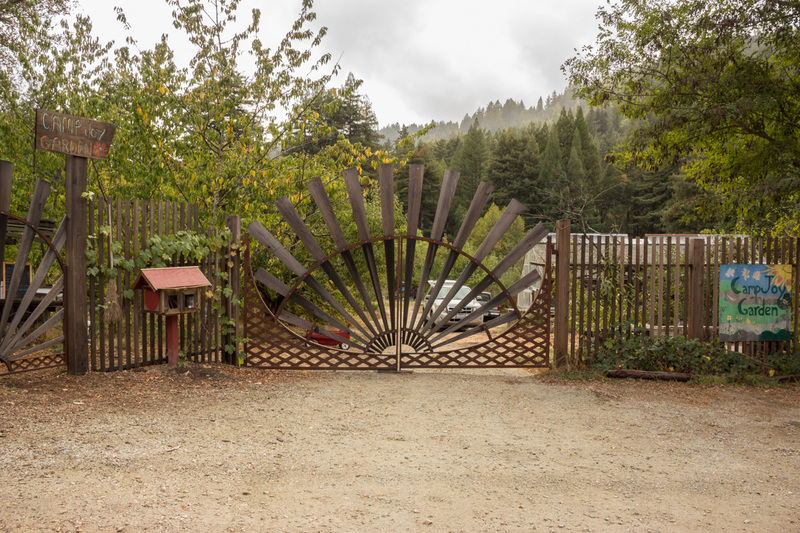 San Lorenzo Valley Museum is having their annual Veterans Dinner this Tuesday at Scopazzi’s. 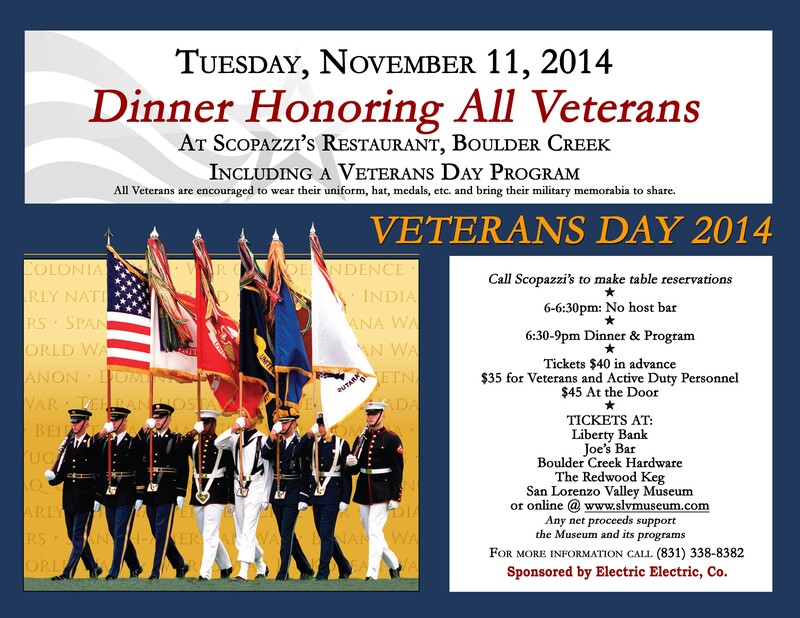 So join us in honoring our local Veterans, enjoy a wonderful dinner, and publicly acknowledge their service. As always we look forward to connecting with our Veterans who have served from WWII through to the present. Please bring a short summary of your military history and a photograph for inclusion in our Collection. Any net proceeds raised from this dinner will be used to benefit the Museum and its programs. Tickets can be purchased online, at the Museum, Liberty Bank, Joe’s Bar, Boulder Creek Hardware, the Redwood Keg in Boulder Creek, and Scarborough Lumber in Ben Lomond. You can also call Scopazzi’s to make your table reservations. Lets all come together and show our vets how much they mean to us and if you are a vet please attend so we may honor you on this day and everyday. Note: To read a little about the contributions of our vets check out Santa Cruz Mountain Bulletin article SLV History titled The War to End All War on page 10 by Lisa Robinson.